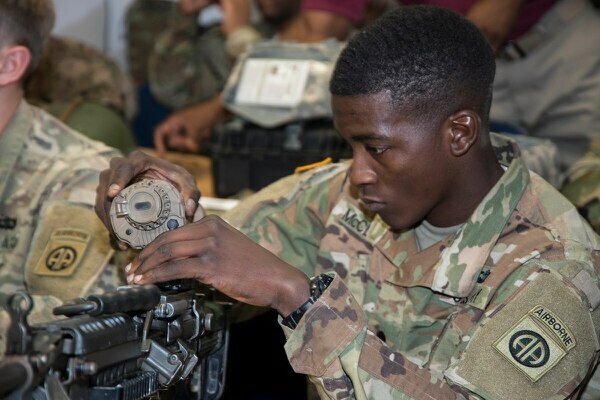 A leap-ahead weapons sight under development by Army engineers is one step closer to fielding after having passed critical airdrop tests recently performed at Fort Bragg, North Carolina. Paratroopers with the 82nd Airborne Division conducted static line jumps with the Family of Weapon Sights-Individual program devices on their carbines, machine guns and sniper rifles. The jumps helped soldiers give feedback on the size, weight and configuration of the new items. Technicians then tested the sites to ensure they held their zero post-jump. “American paratroopers are infamous for attacking when and where least expected and always at night,” said Mike Tracy, branch chief of the Personnel Special Operations Test Branch. The Enhanced Night Vision-Binocular could be in soldiers' hands this year. Those tactics make it crucial for the soldiers to master using night vision optics. But the FWS-I is more than simply night vision. It combines night vision, thermal sights and target acquisition technology. 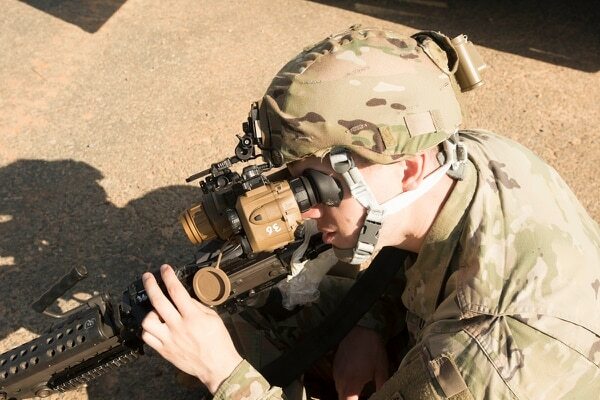 Researchers with the Army’s Program Executive Office-Soldier Maneuver Sensors have paired a next-generation night vision monocle, the ENVG-III, with the Family of Weapon Sights-Individual, or FWS-I, to allow a shooter to view the battlefield through light-enhancing night vision and thermal vision. The system simultaneously permits the shooter to see a 40-degree view while also seeing an 18-degree view from the weapon sight. This enables shooters to fire from multiple positions, around and above obstacles, without exposing themselves. The “picture-in-picture” mode lets the shooter see two different directions at once. For example, if an infantryman were on foot patrol in a tight wedge formation, the soldier or Marine could patrol while observing their left flank, turn to give hand signals from their squad leader and still watch the flank from the camera on the rifle. All of that is an aim to cut down target acquisition time for shooters. Military Times staff participated in a media demo and shoot of the system twice in the past year. The device allows a shooter to fire from the hip and shoot around corners, using the weapon-mounted camera. The night vision portion of the system also can overcome the high-illumination problems that disabled earlier night vision devices. Side-by-side comparisons at more than 75 yards with current night vision systems showed an immediate contrast with thermal. Multiple man-sized targets were visible with both systems at various distances. A man-sized target behind camouflage netting was invisible with standard night vision goggles, but visually jumped out immediately with thermal sights. The first batch of a total of 64,000-night vision devices, the ENVG-III are arriving at infantry and special operations forces units this year. The 36,000 FWS-I devices are expected to hit units sometime in late 2018 or early 2019.